Raptor Resource Project Blog: The Decorah Eagles Have Surprised Us With A New Nest! The Decorah Eagles Have Surprised Us With A New Nest! Mom and Dad are surprising us again. We have noticed in recent weeks that they seem to be building an alternate nest in the neighborhood. This is not unusual for bald eagles, but it is new for Decorah. The two bald eagle nests in the photograph above are located roughly 500 feet away from one of Minnesota's busiest interstate highways. The nest at the left was the first nest built by the resident bald eagles, who raised at least eight clutches before deciding to build a new nest in the same tree. I watched them raise young in the lower nest last year, observing in fits and starts as I drove by or sat immobilized in traffic. But I wasn't able to watch them build their new alternate nest, located above and to the right of the original nest, so I'm not sure exactly when they started. I've seen eagles sitting in and perching by the alternate nest this fall, and I'm pretty sure the female will lay eggs in it come late winter. Alternate nests may serve as 'insurance'. If the occupied nest is destroyed or rendered unusable, the eagles can quickly occupy the alternate without having to build a new nest. Changing nests from year to year helps the eagles avoid parasites and 'nest mates' who are attracted by the food the eagles bring in. Shifting nests from year to year may help the eagles avoid parasitism. The additional nests may be a way of marking territory. They warn other breeding pairs away and demonstrate fitness on the part of resident adults. Eagles like to build nests. 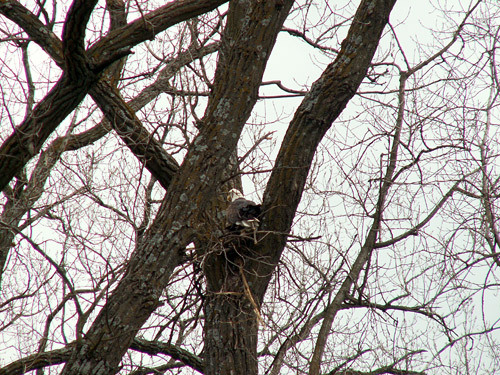 Although we haven't seen it in Decorah before, multiple nest building is a relatively common activity: in most but not all instances bald eagles will have more than one nest in their breeding territory. In one study of 924 territories, eagles were found to have an average of 1.5 nests in their breeding area. In another study of 318 territories, 45% of eagles had two nests or more (Stalmaster, 1987). Eagle nests can be classified as active (shows or showed evidence of breeding by bald eagles during the current or most recent nesting season), alternate (intact or partially intact and used by bald eagles at any time during the past five nesting seasons, but was not used during the current or most recent nesting season), or abandoned (inactive through six or more consecutive nesting seasons). It takes six years for a nest to go from 'alternate' to 'abandoned', since last year's alternate nest might become this year's occupied nest. Why? Only the eagles know for sure. 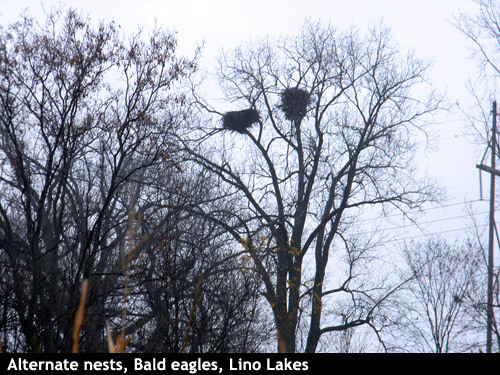 It is interesting to us that, like the bald eagles in Lino Lakes, the Decorah eagles occupied a single nest for several years before beginning an alternate. The new nest in their territory is located nearer the trout hatchery, roughly 300-500 feet from their current nest near the woodshed. We don't know at this point which nest they will occupy next spring. Bob did find a dead buck beneath the foot of the 'alternate' tree, which could have played a role in their decision to choose this particular location. But we don't know that for sure. Bald eagles commonly build multiple nests on their nesting territory. Mom and Dad have started construction of an alternate nest about 300-500 feet from their current location. We will not do anything that might influence them to abandon construction of this nest, including camera installation or nest invasion. We cannot and will not disturb them: building multiple nests is part of eagle life. The health and welfare of the eagle family is more important than the nest they choose or our desire to watch them on camera. We'll miss following them, but it is exciting to see them building a new nest! Once again, Mom and Dad are giving us new insights into the lives of bald eagles. We will provide photographs and updates from the ground. We will consider putting a camera in it next year, in early fall. Is the length of time a mature pair stays on territory correlated with the construction of alternate nests? Five or six years would be plenty of time for parasites and 'nest mates' to become problematic, or at least annoying. Is the length of the bond between the pair a factor? More experienced (older) Bald eagles seem to be better at parenting in many ways. Would a more experienced pair be more likely to build an alternate nest for insurance? Does the actual or perceived encroachment of other adult eagles play a role? If other eagles are present, resident eagles might feel a little more compelled to mark territory. We would really like Mom and Dad to use the nest they have occupied for so long, but we cannot and will not interfere if they decide to use the new nest. As we said in an earlier post on intervention, their lives are a gift we have been privileged to share. We can only hope we'll get another chance in 2013. Stay tuned and we'll keep everyone updated as the situation develops! Book: The Bald Eagle. Mark Stalmaster, 1987. This is a wonderful book, and the eagle illustrations are charming. Book: The Bald Eagle: Gerrard and Bortolotti. Another great book. Green Value Nursery, Hugo, MN. Thanks for letting me park and walk across your land to get photos of the Lino nest. I'll buy flowers from you next spring! I spoke with a few people on the board that live on the lake and the City's environmental coordinator and they believe the nest has been on Peltier since about 1993 or 1994. Marty the environmental coordinator said he would check back to see if he could find the exact date. He also said the old nest has not been used the last few years. Established in 1988, the non-profit Raptor Resource Project specializes in the preservation of falcons, eagles, ospreys, hawks, and owls. We create, improve, and directly maintain nests and nest sites, provide training in nest site creation and management, and develop innovations in nest site management and viewing that bring people closer to the natural world. Our mission is to preserve and strengthen raptor populations, expand participation in raptor preservation, and help foster the next generation of preservationists.